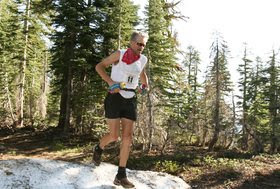 The Auburn Journal wrote an article about Tim Tweitmeyer's 200 mile run to raise awareness for a resolution (and hopefully upcoming Senate bill) to give the Western States Trail federal protection as a national historic or scenic trail. Hopefully Tim isn't going have any issues with the forest fire smoke - 200 miles is a long way! If Tim succeeds in his push to make the trail a national historic trail, what would be the impact on the WS100 race? Would it open the door to a greater number of entrants allowed? Let's hope so. My first thought when I read the article was that the board cancelled the WS100 race due to fire danger but now Tim is going to run it? If it's safe for him to run the trail, then why isn't it safe for the registered runners? Auburn Journal Reports that Tim pulled out of the run early. Too much smoke in the area. We where running in Auburn yesterday from the Overlook to Cool and it was nasty...too much smoke settling in the valley. It looks like a long dry and smokey summer...What a bummer.